Patricia passed through the veil of the unknown after her death experience at the age of eleven. She shares with you her firsthand knowledge of "What Happens When We Die". Questions such as - What does their world look like? - Do our pets go to Heaven to be with us? - What happens during the death transition? - Is there a judgment? - What happens to people who commit suicide? And so much more! Only a handful of the truly gifted in all of history have been able to cross the "veil" to the Higher realms and bring back it's closely guarded secrets for the betterment of mankind. Patricia Mischell is one of those gifted few. Experience these mysteries first-hand. If you have already listened to Patricia's tapes on "What Happens When We Die" then you will enjoy these tapes. These tapes contain personal stories of people who have crossed over into God's world. Patricia shares with you her own death experience at the age of eleven and what her transition was like. The tapes contain up-to-date information on "What Happens When We Die". Unlock the enormous powers of your mind by listening to Patricia's methods on how to tap into your Higher Self; how to generate, apply and prevent loss of psychic energy; - ESP experiments in psychometry, telepathy and energy; visualization; the power of thought; the power of concentration! and more. Patricia's methods are simple and easy to understand. This workshop series comes with a twenty-eight page instruction booklet. 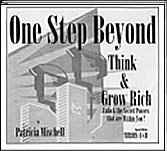 Patricia takes you... One Step Beyond Napoleon Hill's book "Think and Grow Rich". You will learn how to tap a vast reservoir of mental power born within that will direct you to virtually anything you want - a better job - more money- a rewarding love life - ability to overcome obstacles. Achieve any ambition. Learn whatever your mind can conceive and believe you can achieve. Get this 12 tape series and SAVE, SAVE, SAVE. This album has everything from One Step Beyond Think & Grow Rich Volumes 1 & 2, plus the savings. Patricia gives you techniques on how you can Tap into the power within you. You will learn about the conscious mind. 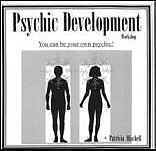 She teaches you how, you too, can tap the Universal mind of God to open your Natural Psychic Abilities. Patricia teaches you how to open the Higher powers of your mind! This tape teaches you all about the subconscious mind & your higher self! Great technique on how you can solve problems you may be encountering in your life now. Plus, you will be able to release the negative programming of yesterday. I believe each of us has been created to become infinitely more then what we are in this moment. These tapes will help you to unveil that special person you were meant to be! Is your life up and down? Have you wanted to be a success? Techniques and ideas on how to be everything you want to be. Are you lacking in life? Why miracles happen in our life. Techniques you can use to receive yours! Do you say, here I go again? Maybe someday I'll get there! I need to be the real me! Have you been rejected for being yourself? Are you afraid others will know the real you? This tape will liberate you to live again.